White metals are popular options for modern wedding band designs, and cobalt is one of the newer gold alternatives. Cobalt jewelry has the luxurious look of platinum without the high price tag. This type of wedding band is a great choice for a couple on a budget, but it's important to understand the basics before you buy. According to Chemistry Explained, cobalt became an official element in the periodic table in 1735, but its use in jewelry is very recent. By blending this element with other metals, manufacturers can create a beautiful and durable alloy that is perfect for wedding jewelry. Since cobalt's introduction to the jewelry market, it has become a popular alternative to other metals. This results in a durable, attractive alloy with many advantages. Cobalt is very bright and attractive, and it has a white-gray color similar to more expensive precious metals. In addition, the white color is trendy and goes with other white metal jewelry like sterling silver and white gold. Cobalt alloys are extremely durable and are used in the aerospace industry. Rings made with this material are scratch-resistant. In its alloy form, cobalt is hypoallergenic. In fact, this alloy is used for making medical devices. This makes it a great choice for people with metal allergies. As an alloy, cobalt chrome is extremely stable and doesn't tarnish. A coating is not required to maintain the white color and high shine, and your ring will look brand new for years to come. Cobalt jewelry can be resized, unlike other durable alternative metals. Before you decide to purchase a cobalt wedding band, there are a few considerations to keep in mind. Cobalt wedding jewelry may be difficult to find in some locations, and there are not as many ring designs available as other more popular metals. However, if you shop online, you'll still find a good selection. More designs are available for men than women, but there are rings for both genders. Rings made out of cobalt are heavier than titanium, platinum, or gold rings. This isn't a problem for many people, but if you dislike the feel of heavy jewelry, cobalt may not be for you. Since it does not bend and stretch the way gold and other metals do, a cobalt ring will have to be cut off if it can't be removed during a medical emergency. According to Tungsten World, cobalt chrome rates between 7 and 8 on the Moh's hardness scale. This makes it a more durable choice than soft precious metals like sterling silver, gold, and platinum. This hardness means that cobalt chrome can't be made into some of the intricate designs of other precious metals, but it also means it's more scratch resistant. Cobalt is harder and more resistant to scratches than titanium, another popular alternative metal. However, cobalt chrome isn't quite as hard and scratch resistant as tungsten carbide. Additionally, tungsten carbide can shatter when dropped on a hard surface, but cobalt rings will not. 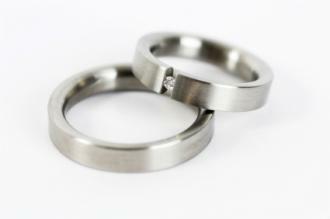 CNN Money reports that cobalt wedding bands are among the most cost-effective choices for today's couples. A typical cobalt band costs between $200 and $300, while a similar platinum band would cost about $1,900. This makes cobalt an attractive option. If you love the look, durability, and affordability of cobalt, you'll have a number of great options for wedding jewelry. No matter which style you like, there's a cobalt ring out there for you. Cobalt Chrome Wedding Band with Diamonds - This beautiful 10-millimeter-wide band from Just Men's Rings has a masculine, chiseled design, and it boasts 0.20 carats of round, bezel-set diamonds. It has a stylish brushed finish and comes in sizes six through 14. It retails for just under $700. 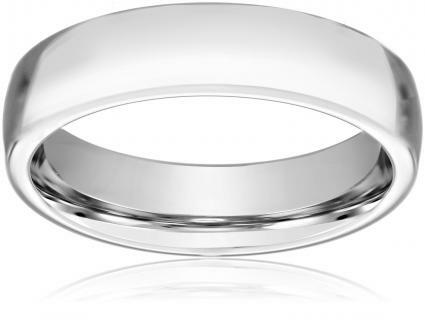 High Polish Plain Cobalt Wedding Band - If you love simpler styles, this plain cobalt band from Amazon.com may be perfect. The ring is six millimeters wide and has a mirror finish and comfortable shape. It comes in sizes eight through 13 and retails for $65. Laser-Engraved Paisley Cobalt Chrome Wedding Band - This beautiful design from Titanium Kay features elaborate laser engraving in a feathery paisley motif. It is eight millimeters wide and has a high polish finish. This ring comes in sizes seven through 13.5 and retails for $100. Cobalt Custom Fingerprint Ring - This unique design from Tungsten World features an engraving of your or your mate's fingerprint. It comes in 6mm and 8mm widths, and your choice of pipe cut, domed, or beveled. After ordering, email the company with four to six images of the fingerprint you want engraved on the ring. The site suggests ordering half a size smaller than normal, but you can call them for a personal fitting if you're unsure. Pick this ring up for just under $200. Delia Cobalt Chrome Wedding Band with Pink Sapphires - This gorgeous option from WeddingBandsforBoth.com is four millimeters wide and has a high polished dome shape. 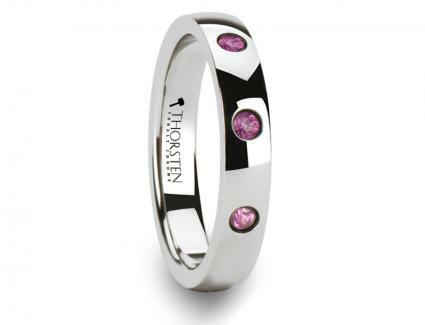 Three round pink sapphires glimmer from bezel settings in the band. It comes in sizes four through 12 and retails for just under $500. CHESTER Comfort Fit Carved Celtic Knot Design Cobalt Ring - This pretty ring with a raised Celtic knot design on a black background is 7mm wide. You can opt to add a variety of engraving styles on the inside of the ring for an added fee. Larson Jewelers offers a free lifetime warranty on this ring which retails for about $350. If you're looking for a modern ring that has the sleek good looks of platinum, is more durable than other performance metals like titanium, and is one of the most affordable options on the market, a cobalt wedding band may be the ideal choice for you. These lovely rings come in a wide range of styles for men and women, so you're sure to find the ring of your dreams in jewelry stores or online.